Level 3-4 is the fourth level of Fire Mountain in Mario vs. Donkey Kong. The high score for this level is 29500. The level opens with a cinematic showing Mario jumping up red platforms and then pressing a blue Color Switch to jump up blue platforms and collect a Present. The player can cross the red bridge with Lava Bubbles, move past the Kurasshā, and ride a moving platform to reach the other side of the map. The player then has to jump up red platforms to reach a blue Color Switch. 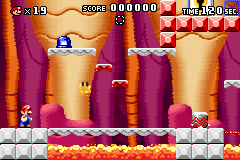 Or the player can stand in the center of the red bridge with the Lava Bubbles and perform a Handstand Double Jump to reach a red platform above. The player can then press the blue Color Switch, jump across to the platform on the right, and ride a Kurasshā to reach the other blue Color Switch. Once at the blue Color Switch between the two Kurasshās, the player must jump up the blue platforms and move left to find the Key. Then the player has to press the red Color Switch nearby and drop back down to the red bridge below. After crossing the red bridge, the player has to avoid the Kurasshā and ride the moving platform to the other side, and then jump up the red platforms to reach the locked door above. In the second area, the player needs to ride a Kurasshā up to reach the next platform. 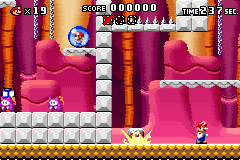 The player then has to climb up ropes while avoiding the fire from a Katakata Kaen Heihō and then jump over a pair of spikes at the top. Next are some Ninjis the player has to jump across, followed by some Katakata Kaen Heihōs and ropes that will lead to a 1-Up Mushroom and the Mini Mario. Red: In the first area, in the path of the Kurasshā on the far right. Yellow: In the second area, next to the first Katakata Kaen Heihō, which the player needs to throw into the spikes to reach. Blue: In the second area, below the Mini Mario in an area with Ninjis.